Jacqueline Simcox specialises in silk textiles from China and Central Asia and has examples from India and Southeast Asia, together with works of art. Textiles for sale include court costumes, palace furnishings, silks for buddhist and daoist use, as well as wall hangings, pictorial subjects and other decorative pieces. The company has examples of all the main textile techniques, including embroidery, brocade and tapestry, dating from the 2nd-19th centuries. 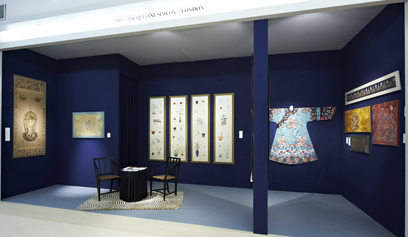 Jacqueline Simcox worked at Spink, the London fine art dealers, where she was a director of their Oriental Department, before starting her own company in 1996. She has written numerous articles on Chinese textiles, catalogued private collections and contributed essays to museum exhibition catalogues, such as ‘Celestial Silks’, Art Gallery of New South Wales, in 2004. More recently she has co-authored, with John Vollmer, a book on the imperial Chinese textiles in the Mactaggart Art Collection, University of Alberta, in Canada. ‘Emblems of Empire’ was published in 2010. She also gives lectures: recently at The Victoria & Albert Museum and The Royal Academy in London, as well as teaching Chinese textiles to the post-graduate diploma course at SOAS, London University. Jacqueline Simcox 專精於中國,印度,中亞及東南亞的紡織品和藝術品之交易. 營業項目有中國宮廷服飾、皇室傢俱、緙絲、佛教與道教用絲織品, 以及各式精美的刺繡掛布等織品. 所有的藝術品均為2-19世紀. 雪梨新南威爾斯藝術館的中國織品特展 ‘Celestial Silks’ 的展覽目錄, 2004年. 與知名中國紡織品學者, John Vollmer, 共同為加拿大阿爾伯塔大學的Mactaggart Art Collection中之宮廷服飾編制目錄, ‘Emblems of Empire’, 2010年出版. Ms. Simcox經常於各相關學術機構演講及教學, 像是倫敦的維多利亞與亞伯特博物館(The Victoria & Albert Museum)及倫敦皇家藝術院(The Royal Academy)中配合特展所做的演講. 並且也在倫敦大學亞非學院(SOAS, London University) 教授中國與亞州織品之課程.